The selection meeting for the next issue of Cast On (Fall 2013) was on Monday. 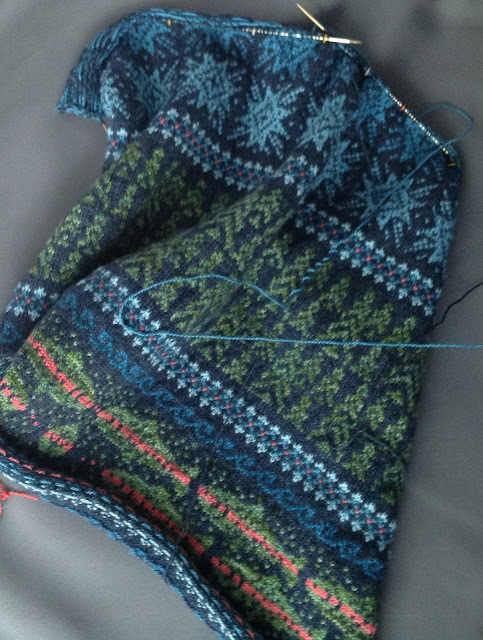 The focus of the issue is knitting for men and Fair Isle and steeks. There were lots of good proposals. 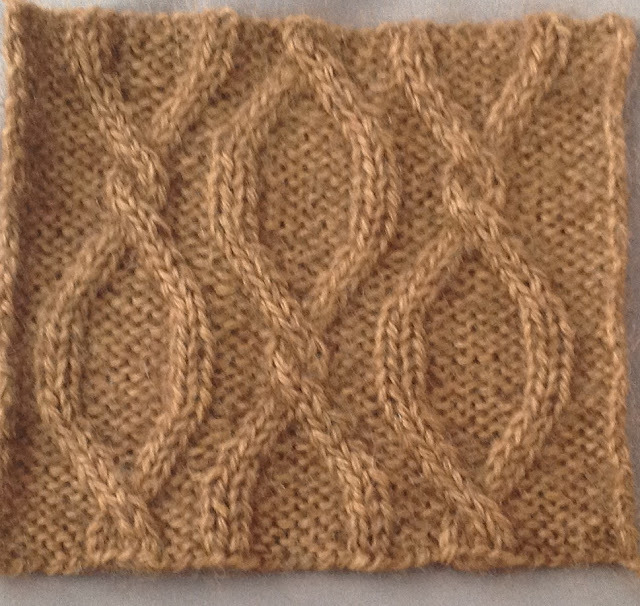 The issue will also have some colorwork designs using intarsia and slip stitch patterns. 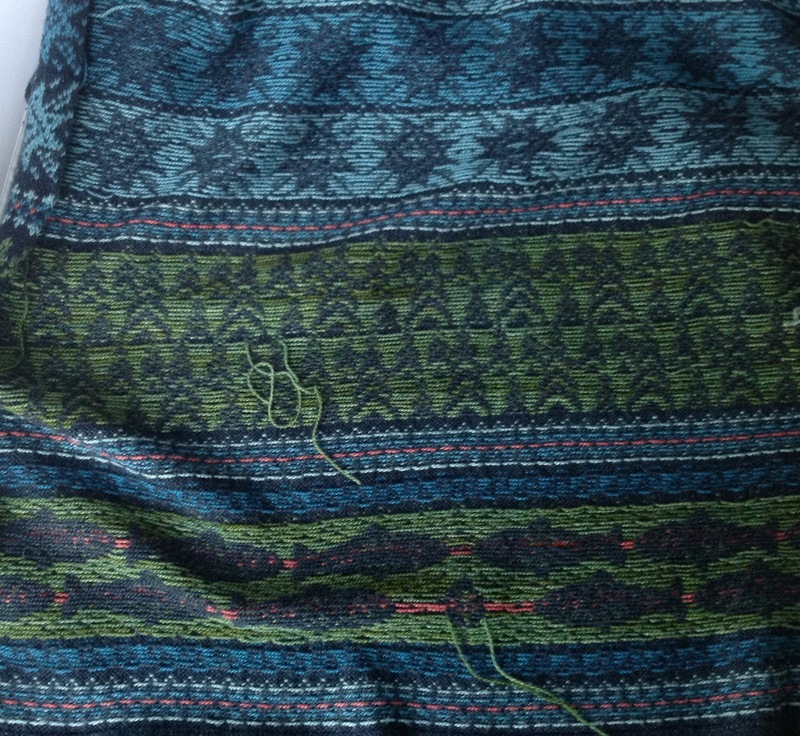 I am doing the stranded sweater and a few other things since the stranded sweater is going so well. Five students completed Lesson 3 of the Basics class this week. I think that is a record. I believe many of them will move on to the Masters Program. I wish them good luck! Continuing on with the "how to read your work" theme, this week's topic is about how to read more complicated cable patterns. This week, I will discuss cables which travel across the background. Typically the background stitch for cable pattern is reverse stockinette stitch. 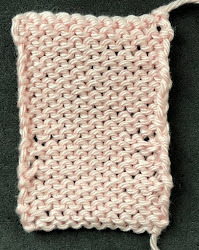 For a cable to travel, the stockinette stitches are cabled over the reverse stockinette stitches. 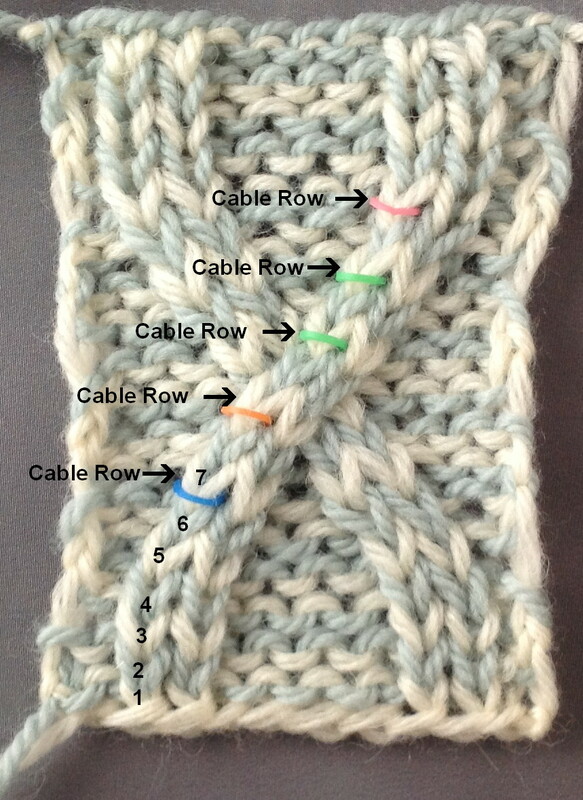 I actually find these types of cables easier to knit. 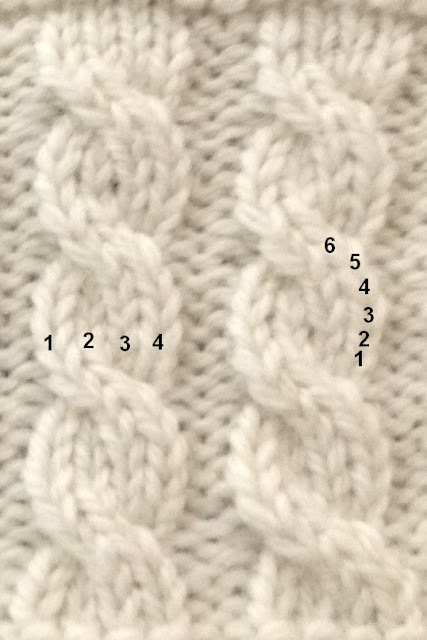 The number of reverse stockinette stitches between the cables can be a guide line. Generally, the cables travel every other RS row so if you are working flat, not much brain power is required. 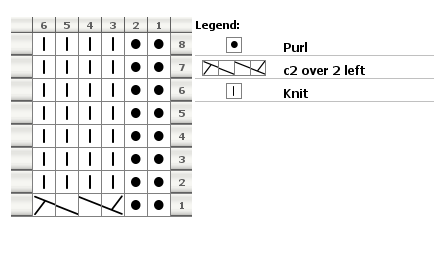 Reading the work once it is knit, can be a bit more difficult. The key is knowing where the first cable row is. Once you have figured that out, it is much easier. 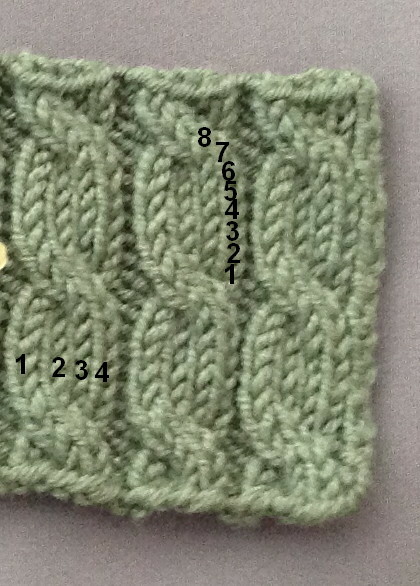 In the photograph below, I've placed row markers on all of the cable rows. As we saw last week, when you cable a row, it affects the rows below so it can look like the cable starts sooner than it does. As you will see in the video, if you can't tell where the first cable row is, turn the work over and you can see it more clearly. Sometimes it is easier to see in the chart. 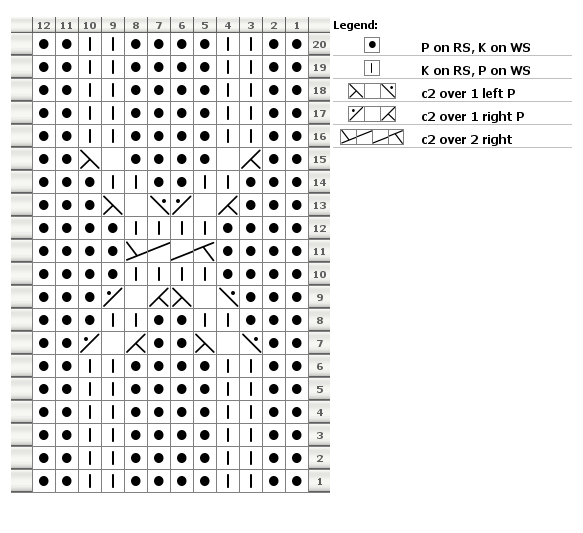 I've charted this simple swatch. 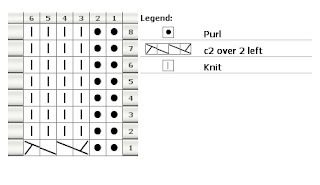 Next week we will look at some SIMPLE lace patterns. Here is a chart for the cable. I've made good progress on the front. I'll be shaping the neckline next. I've ordered pewter clasps for the opening. I thought it might be interesting to see the WS of the front. I've seen several designs lately where the WS of stranded work is on the RS. It is interesting to look at but I would be very concerned about the snags. This is the way stranded work is supposed to look. If you consistently keep one color on top, you can achieve this. I've had several requests to show how I do stranded work. I'll do a video next week. I AM NOT A FAIR ISLE EXPERT (no one who refuses to do steeks can say they are) but my stranded tension is pretty good.